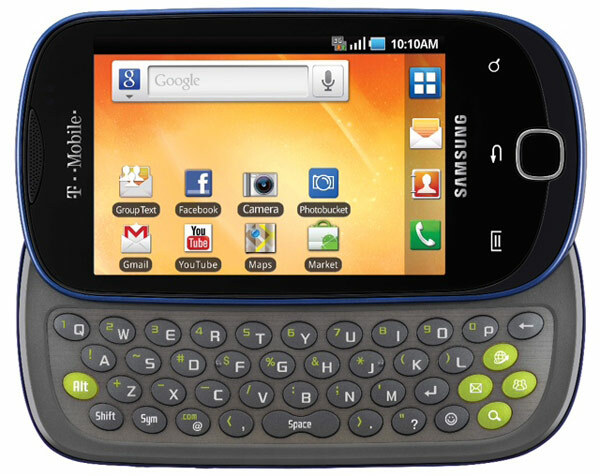 We've heard rumblings that Samsung's Exhibit 4G would be making its way to T-Mob on June 8, but now the carrier has confirmed that the Gingerbread smartphone will be available sometime in June. The Exhibit will join Samsung's Gravity Smart, both featuring grounded sub-$100 price tags (after $50 rebate) when they hit stores. T-Mob is displaying the Exhibit with violet and black finishes, and says you'll see "theoretical" peak download speeds of 21Mbps on the HSPA + handset. As for the Smart, the carrier's first Android-powered Gravity smartphone will launch with 2.2 Froyo, and includes a slide-out QWERTY keyboard, so you'll be sending Group Texts to 50 of your closest friends with four rows of hardware keys. Both phones include 3 megapixel rear-facing cameras with flashes, while the Exhibit adds a front-facing cam as well, so that myTouch 4G girl may be hawking a new smartphone on your TV later this month.